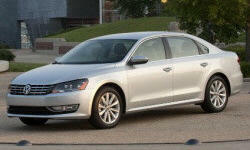 Why the 2013 Volkswagen Passat? excellent choice: solid, serene, safe, reliable tho a tad small in rear seats (same as c class on which glk is based, so no surprise). excellent highway cruiser, 6-11 hour non stop drives on highways leaves one feeling fine. found ex loaner as cpo, 19k miles for $30k, prem 1, real bargain. update jun 2014: traded for cpo 2013 vw passat s 2.5 automatic in jun 2014, cut my operating costs in half but still get roomy, serene, engaged german driving experience. the glk needed $1500 to pass inspection, mainly new tires. the glk was a fine car but i was tired of the ongoing high costs and im thinking of a move to an area w/o a nearby mb dealer. the cpo vw 3 free 10k interval services, two more warranty years with a cpo for $16600 before tradein, $9100 otd after trade, glk payoff, ttl. for $4k more i could have gotten a cpo 2014 passat wolfsburg 1.8. after several test drives over several days i chose the cheaper 2.5. why? i prefer cloth seats (s), steel wheels for snowy/potholed nothern roads, i have standalone plug/play sirius radio, 2.5 is fine in passat, saved $4k. passat is cavern-like roomy, quiet. my engineer pilot son who also has an mb c class agreed that the passat is almost 90% of mb at 50% of the cost. i get 26mpg suburban, 36mpg highway in the 2.5 s. the new 1.8 is totally (!) transforms the jetta but not so much the passat, at least not $4k worth for me now. the 2.5 gets an undeserved bad rap from the car media. Why Not the 2013 Volkswagen Passat? would like taller windshield but then again this passat is a sedan, not an suv. im the writer, sorry i cut & pasted using an ipad mini, i want my cpo 2013 vw passat s review to state clearly that im very happy with my passat: almost 90% of my glk at 50% of the cost. my apologies guys.